Catalan voters anxiously wait for the results of the 1 October 2017 referendum. Parrot Pascal/ABACA/ABACA/PA Images. All rights reserved. Catalonia’s 1 October referendum produced some shocking images: polling stations stormed, elderly voters with bloodied faces, fire fighters (of all people) beaten by police. Coverage in the press and widespread sharing on social media ensured a PR disaster for Spain. Catalonia’s separatists, for a moment at least, have gained the world’s attention and a share of its sympathy. But how far should that sympathy extend? One can condemn the violence and leave it there (as, for instance, Belgium did). But the more fundamental question is whether Catalonia has a right to secession. That is not just a question about the recent poll. Even if one rejects the legitimacy of that poll, one still faces the question of whether another should be held. There is no reason why Catalonia could not hold an orderly referendum of the Quebec and Scotland kind. What has been stopping it so far is Spanish opposition. So, must Spain give way? That is not an easy question to answer because it is far from clear what would give any region a right to secede. The public debate – in Catalonia, Spain and elsewhere – is not much help. People tend to decide these issues on grounds of loyalty and emotion. There is a lot flag waving; much less reasoned argument. For my own part, I have wrestled with the question of secession for many years. I have taught the topic at universities around the world: in the US, Bangladesh, Ireland and Scotland. Secession has played a critical role in the history of all those countries and students have had valuable points to make. But even after my debates with students, I have struggled to resolve matters in my own mind. It is not that I don’t have an intuitive judgement about the issue. As I indicated in a piece I wrote during the Scottish referendum, I do think regions like Scotland and Catalonia should be allowed to secede. What I have struggled with is locating an adequate justification for that position. In the literature in political philosophy (my field) there are some fascinating books and articles, but few arguments I find convincing. It is only now, in reaction to Catalonia, that I finally have a better sense of what is grounding my pro-secessionist stance. I return to that grounding below, but first let me review what I regard as some common false starts. First, democracy. This is the ‘go to’ argument of many Catalan secessionists. According to Catalan President, Carles Puigdemont, a vote on independence is simply an “expression of a free democracy”. In this view, Catalans have a right to decide whether Catalonia is independent just as they have a right to decide on any other issue affecting them. The problem with this argument is that it assumes what is precisely at issue: that Catalonia represents the appropriate constituency to make this decision. Another plausible constituency would be Spain itself. For it is not just Catalonia that is affected by the issue of independence. Catalan independence would have significant repercussions for Spain’s economy and identity. It would also have ripple effects on other regions, including the Basque country which has only recently escaped the violence of its own secessionist conflict. In short, the democracy argument fails to overcome what we might term the ‘symmetry problem’. Democracy can be advanced both as an argument for secession and an argument against it. To justify secession, we need to justify ‘asymmetry’: to explain why it is Catalonia, not Spain as a whole, that has a right to decide. Democracy is not the only argument that suffers from the symmetry problem. Another is national self-determination. The idea that a nation has a right to determine its own future is fine as far as it goes. The problem arises when there is more than one nation in play. Catalan national self-determination butts up against Spanish national self-determination. One cannot give full expression to the one without limiting the other. Some will stamp their feet at this and proclaim that “Catalonia is not Spain”. If there were two discreet nations then Spain would be other-determining not self-determining when it takes part in Catalan affairs. But the very fact people proclaim this slogan demonstrates how controversial it is. National identity is not physics. Nations exist, split or overlap depending on inter-subjective beliefs. As long as there are people inside Catalonia and the rest of Spain who believe in an over-arching Spanish nation, the concept of national self-determination can be invoked by both sides. It offers no firm ground for secession. 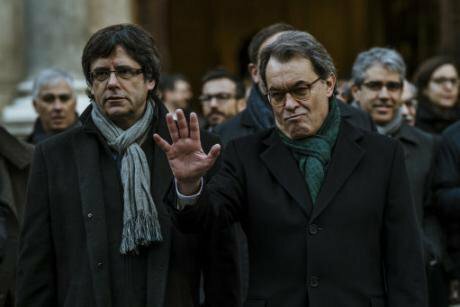 Current Catalan President Carles Puigdemont and former Catalan President Artur Mas. Matthias Oesterle/Zuma Press/PA Images. All rights reserved. Are there no arguments that avoid the symmetry problem? Yes, at least two. One is self-defence: the idea that group of people can have a right to secede when threatened by some profound injustice. Such an argument can prove compelling. Having recently survived Saddam and ISIS, and with the future still so uncertain, Kurdish Iraq can plausibly make an argument of this sort. Catalonia, however, is different. It did experience severe repression under Franco but modern Spain, whatever its faults, is a peaceful liberal democracy. In terms of wealth, security and freedom, it is among the most successful countries on Earth. Catalan secessionists complain that, as a richer region, they pay more into central government than they get out. But this complaint should not arouse much sympathy. Indeed, for those on the left, with their concern for equality and redistribution, it should be treated with particular disgust. There might be more nuanced complaints to be made against Spain’s fiscal arrangement, but even if we accept them, they do not amount to profound injustices of the ISIS or Franco kind. Admittedly, things could get worse. If the state violence we witnessed on Sunday were to become routine, then a self-defence argument would become more convincing. Let us hope, for everyone’s sake, that that is not where we are heading. The other argument that avoids the symmetry argument is freedom of association. This the kind of argument that it takes a philosopher to come up with. The argument likens states to clubs. Just as you and your friends don’t need anyone’s approval to set up a new club or split from an old one, so regions don’t need their state’s approval to secede. The problem with the argument is quite simple: the analogy fails. States are not like clubs. People do not voluntarily join states for the sake of their hobby or passion; they are forced into states for the sake of justice and peace. States set the background rules; clubs and other associations offer people the opportunity to pursue particular interests. If Catalans want to form associations, they can do so. Catalonia already has all kinds of clubs and associations, including many operating across the region (the Catalan Football Federation, the Catalan Association for Science Communication and so on and so forth). They don’t need a state to be their club, nor should they want it to be. A state that tries to be a club is like a parent who tries to be a friend. We need states. We need parents. But if we are to maintain our individual autonomy, these unchosen authorities in our lives must assume their proper roles and not pretend to be something they are not. Those are the arguments that I find unconvincing. So why do I favour independence referendums? For a while I thought the best argument was merely pragmatic; the ‘let-insiders-vote rule’ is, among the alternatives, the best means to minimise conflict. But now I think there is more to be said. It is important that we, as citizens, feel some kind of connection to our state; that we see it as legitimate or at least not as wholly illegitimate. This is not because states are like clubs, but precisely because they are so different. States coerce us. They tell us to do certain things and punish us if we disobey. Such coercion can be justified. Everyone except anarchists accepts that. But it is important that when they coerce us, we have some sense that they are not merely coercing us. We need to be able to look at the state and think that, in some sense, it is our own. The state institutions we interact with and the laws we live under should feel familiar and benign; like they are there for us and our society, not some outside power. When instead the state seems foreign or hostile, it is hard to feel at home in the world. 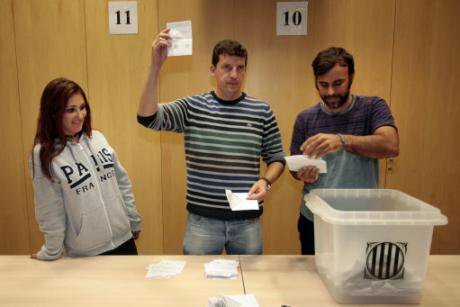 Counting ballots at a Catalonia voting station. Parrot Pascal/ABACA/ABACA/PA Images. All rights reserved. As events have proceeded, I think more and more Catalans are experiencing a sense of alienation from the Spanish state. The spectacle of Spanish police being shipped in (quite literally) from other areas of Spain, has not helped matters, evoking, as it does, parallels with foreign occupation. Of course, not everyone in Catalonia feels alienated. The thousands who protested in Barcelona’s unity rally on Sunday clearly believe in the legitimacy of Spain. That is why it is crucial that the matter is settled by a free and fair referendum in which everyone in Catalonia is given a say. Does this ‘alienation argument’ escape the symmetry problem? I believe so. If Catalonia were to secede, the Spanish economy would suffer and many Spanish people would be profoundly upset, but they would continue to live under a Spanish state that most recognise as their own. The same is not true of Catalans who are denied a referendum. I realise the argument raises many questions. How many people need to feel alienated to demand a referendum? How alienated must they feel? What about the possible costs of secession, for those inside and outside the seceding region? There cannot be an absolute right to secede no matter how high the costs – that would be absurd. But how high must the costs be to defeat the right to secede? Perhaps the most difficult question is that of minorities within minorities. Consider, the case of the Val d’Aran, an area of Catalonia that has its own fierce sense of independence. If Catalonia secedes, must the Val d’Aran be granted its own referendum? 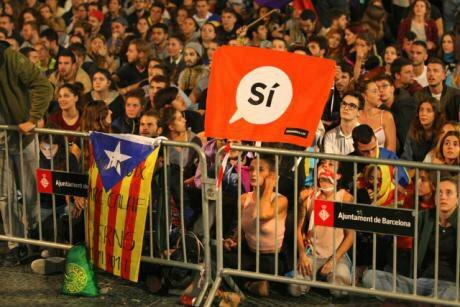 The alienation argument would suggest so, but many, including Catalan separatists themselves, would demur at the prospect of repeated secession. I cannot hope to settle these questions here. My thoughts are too tentative; these matters too complicated. This brings me to a final point. Because secession is such a morally complicated issue, it is crucial that both sides show greater respect for each other. There is no black/white here. We are all in the grey zone of reasonable disagreement. Contrary to statements by leading politicians, the Spanish government is not Franco and the Catalan government is not Hitler. The parties to the conflict need to stop waving flags and start making arguments. This point is perhaps particularly important for Spain since it is the Spanish government that has the tanks and riot squads at its disposal. With such power, it is much too tempting to use it. The recurrent theme of the Spanish government – and most recently, the king – is that the Catalonian crisis is first and foremost a criminal justice issue. Nothing could be further from the truth. Yes, the referendum broke Spanish law, but it is perfectly evident by now, from the civil rights and other great movements of the past, that reasonable people sometimes do break laws for good reasons. They should not be dismissed as ordinary criminals. Indeed, when millions of your citizens engage in a referendum you have ruled illegal, it is a sure sign that you have a political, not a legal, problem on your hands. This article draws on a philosophical literature on secession that is by now quite extensive. Rather than attempt to provide a full list of sources, let me refer to a few works that might prove particularly helpful. For an excellent introduction to the philosophy of secession see Allen Buchanan’s article in the Stanford Encyclopaedia of Philosophy. The problem I raise with the democracy argument relates to a much-discussed problem in democratic theory called the ‘boundary problem’. For a description of the problem, and one of many attempts to solve it, see David Miller’s article, “Democracy’s Domain”. The freedom of association argument I referred to has been presented by a number of philosophers, including in Christopher Wellman in A Theory of Secession: The Case for Political Self-Determination. The alienage argument I defended has some affinities to Annie Stilz’s “Decolonization and Self-Determination”.